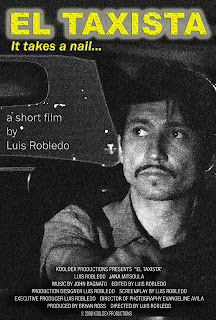 EL TAXISTA--On a dark night, what seems to be a routine shift for taxi cab driver, Ricardo Villamontes (Luis Robledo-A Lonely Place For Dying, Havoc), turns out to be a night where questionable morality and loneliness collide. Norma (Jana Mitsoula-Tru Calling, Stargate: Atlantis), a beautiful, broken stranger enters the cab and the ensuing events change the course of their lives forever. Nothing as it seems...our strangers soon discover the commonalities between them and the secrets they share. Luis Robledo's 3-time award-winning debut, 'El Taxista', not only marks his first foray into directing, it is guerrilla filmmaking at its best. As writer, director, actor and editor of this film, Luis successfully packs all the punch of a theatrical feature into 15 minutes worth watching. We are elated to be a part of this great festival & honored to have been nominated for the Best Short Film Award as well as the Wallflower Press Award to an Emerging Filmmaker! Come check out our little short film that is causing a ripple!!! Bryan Ross (producer), Marisilda Garcia (assoc. producer) and I will be there for the duration of the fest. I look forward to meeting my fellow filmmakers and all you film lovers! A special shout out to Justin Evans, whose feature A Lonely Place For Dying will screen on Thursday, December 4th at the Scottish Rite Temple at 7pm. ALPFD has been nominated for the prestigious Heiniken Red Star Award for Best Film, among others. This is a movie I worked on as an actor, starring Ross Marquand and Michael Scovotti, featuring Hollywood heavyweights James Cromwell and Michael Wincott. NOT TO BE MISSED!!! Congratulations to Justin, Erin, Catherine and all of the ALPFD team!